Packagoals cater for a range of sports and playing age groups. Just roll them out of the bag, pump them up and you're ready to play. A unique range of products that address the challenges faced by those with no storage facilities. These are portable, storable, professional looking and above all safe. Made from heavy duty thermoplastic, Packagoals are rigid, safe and maintenance-free. Featuring a unique auto-lock valve and slick design, each of the goals not only look professional but allows for rapid inflation and deflation. Easy and quick to transport, the goals importantly provide for compact storage. 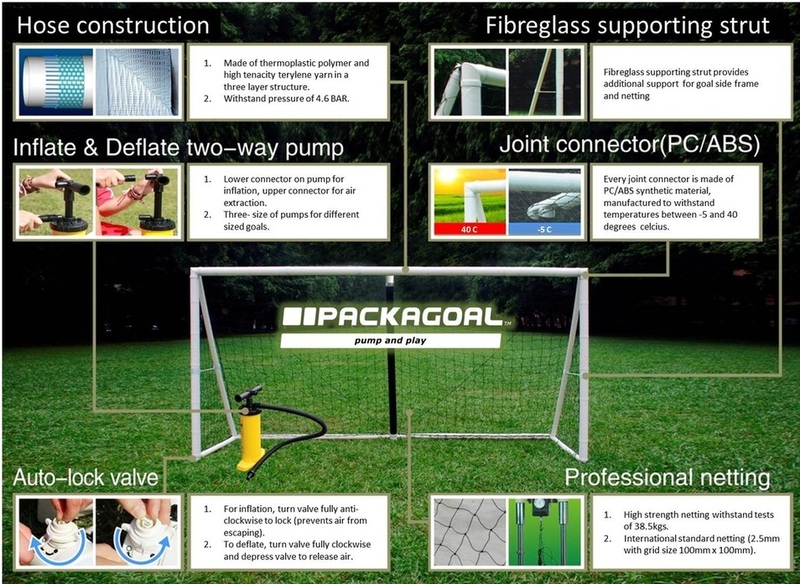 Click on the images below to find out more about the Packagoal range. Easy to set up and quick to transport, Goalball Packagoals are the world’s first portable goalball goal, allowing the game to be easily played in a wider variety of locations﻿﻿. ​Easy to set up and quick to transport, Lacrosse Packagoals are ideal for training allowing the game to be easily played in a wider variety of locations . Futsal is the only FIFA and NZ Football approved version of five-aside football and the world’s fastest growing indoor sport. Futsal also produces technically excellent players and as such is an invaluable tool for football development. A unique range of water polo products that address the challenges faced by those with no storage facilities and who require goals or fields that are easy to transport. These goals were originally developed for junior hockey. However the narrow gauge netting means they can also cater for many different ball games. This versatility has made the goals popular with schools and clubs alike.